When it comes to investing, there are various types of investments that you can choose from. So many in fact, that it can be overwhelming for many investors, both new and old. In this post, I am going to talk about the different types of investments that you can choose from and then do my best to help you narrow the list down into something more manageable so that you can match the best return with the appropriate risk for each one. Since there are so many types of investments, I need to categorize them so you can more easily follow along. I will do this by breaking the types of investments down into short-term and long-term. In addition, I will also include a category for non-traditional types of investments. Let’s get started. When I say cash, I mean that you keep your money in a savings account that earns you a small return. With interest rates historically low right now, you won’t be making much money with a savings account. But, it is the safest way to earn some interest and not have to worry about losing your principle. Of course, if you are just using a savings account, you want the highest amount of interest you can find. Traditional banks are not the answer. To get a higher interest rate, you need to look online. I love and use CIT Bank. They offer one of the best interest rates for online savings accounts in the country. One step up from savings accounts is bank CDs or certificates of deposit. These tend to offer a higher interest rate. They offer a higher rate because you are locking your money up for a period of time. For example, if you buy a 6 month bank CD, you cannot access your money in the CD for 6 months. If you do, you pay a penalty, which is usually around 3 months worth of interest. Again, with interest rates low, the interest rates on CDs are not very good. In fact, if you are looking for somewhere to put your money for less than a year, your best bet a savings account. This is because short-term CDs are paying less than savings accounts right now. Additionally, with the talk of the Fed potentially raising interest rates, you might be better off just sticking with a savings account. This is because when interest rates rise, so too will your interest rate on your savings account. But with a CD, whatever rate you have when you open the CD is the rate you keep throughout the life of the CD. A money market account is a cash account that invests in extremely short-term bank instruments to earn a higher return. But don’t get too excited about the higher return. Currently it is barely more than what traditional banks are paying. As with CDs, your better bet is to go with an online savings account. When it comes to rising interest rates, short-term bonds are not affected as much as long-term bonds since investors money is only locked up for a short period of time. But, this doesn’t mean there isn’t any risk of losing money with short-term bonds when interest rates rise. Your Best Option For Short-Term Savings? With interest rates low, you aren’t going to become a millionaire by investing in these types of investments. For most people, going the online savings account route makes the most sense, especially when it comes to money for emergencies. If you are really stuck on earning a higher return, you can do what I do and combine options.I keep about 8 months worth of expenses in an emergency fund, but not all of this money is in a savings account. I keep the first $5,000 in a savings account and have the rest in short-term bonds. This way, I can easily cover most emergencies with the $5,000. If I need more, I just sell out of the bond fund. The entire process of selling and getting my money only takes a few days. Since short-term investments are for time frames of less than 5 years, it makes sense then that long-term investments are for timeframes longer than 5 years. Here is a list of the various types of long-term investments. When you buy a stock, you buy equity in a company. The goal is to have the value of the company rise in value, which means that your share of stock will also rise in value. An added benefit is that some companies pay a dividend on their stock. This means that whatever the company earns, it passes along to its shareholders. While short-term investments earn less than 1% interest right now, stocks tend to return on average of 8% per year. Note that this is the average. This means that some years stocks will earn more and other years stocks will earn less, even possibly losing money. But, if you invest for the long-term, you can expect roughly 8% when annualized. Mutual funds and ETFs are simply baskets of investments. This means that when you buy a share of a mutual fund or ETF, you are buying a handful of companies. Just like when you buy a basket of fruit you get many different types of fruit you get many different companies when buying an ETF or mutual fund. 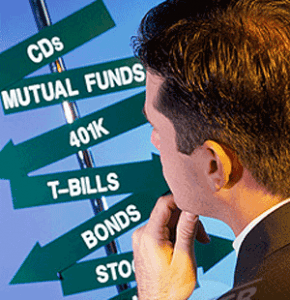 Both mutual funds and ETFs invest in stocks, bonds or both. You have to do the research to find the best mutual fund or ETF for you and your overall goals. Just make sure you pay attention to the fees you are charged with these investments. Since professionals run them, there is a small fee associated with them. You can learn all about mutual funds and what to look for in my mutual fund basics post and about ETFs in my what does ETF mean post. You can also read my comparison of the two as well. One final point about these types of investments, if you invest in a mutual fund or ETF that invests in stocks, you can expect the same 8% annual return as with stocks. There are 2 main types of bonds, corporate and government. Within them are many more categories. I’ll talk about the general nature of bonds first, then go into more detail about them below. Overall, bonds tend to earn a return of around 5% annually. One key point with bonds that many investors overlook is that bonds can and do lose money. Too many people invest in bonds thinking they won’t lose money, but they can. The way a bond works is that a company (or country or municipality) issues a debt instrument (a bond) to raise money for a project. For buying the bond, the issuer will pay you a set interest rate for a specific amount of time. In a general sense, government bonds pay less than corporate bonds because there is less risk with defaulting on the bond. Corporate Bonds: As I just mentioned, they tend to pay a little more than government bonds. Also note that the stronger the company, the lower the interest they will pay. In other words, General Electric will pay a lower interest rate, say 4% on its bonds than will XYZ company which is smaller and has a greater risk of going out of business. XYZ might pay 7% interest. These are known as high yield or junk bonds. Government Bonds: Government bonds are issued to help keep the country running. They pay lower interest than government bonds since there is virtually no chance the government won’t be able to repay its debts. The time it takes for a bond to mature varies. You have short-term bonds which I mentioned earlier, that have a duration of up to 5 years. Longer term bonds can have a maturity of up to 30 years. This means that as an investor, you will receive interest payments, typically twice per year, every year until the bond matures. So, if you invest $1,000 in a bond that matures in 10 years, you will receive interest payments twice a year for 10 years. At the end of the 10 years, you will get your $1,000 back. In addition to the type of bonds I’ve talked about thus far, there are two other types of bonds that I need to mention. The first is inflation protected securities. This type of bond has a set interest rate, but also a “floating” rate that is tied to inflation. These have become popular with investors as they lessen the inflation risk that hurts many bond funds. The other type of bond is a savings bond. These are long-term bonds that are issued by the government. They used to be very popular, but have fallen out of favor recently. Typically you need to hold these bonds for 30 years to earn the full return. Most of the investments I mentioned relate to the stock market. Luckily there are other types of investments that you can earn a return on without investing in the stock market. Rental real estate has grown in popularity with the fall of housing prices. While on paper it is easy to make a monthly income from renting out real estate, the reality is that there is a lot of work involved. Not only do you have to do a lot of research to find properties that will provide you with income each month (they are rarer than you think) you also have to deal with the ongoing management and maintenance of the property. In other words, it is a lot of work. But, it can be financially rewarding. The key is to make sure you are ready to be a landlord. If not, read this post for how to get into the real estate game without being a landlord. You can make money by trading currency. The market for this though is very volatile and will turn your hair gray very quickly. Trust me when I say it is not for everyone. I traded currency in grad school as part of a mock trading experiment and I realized I wasn’t cut out for it. But for others, it could make sense. You can invest in oil, gold, coffee beans, sugar or pot belly pigs too. I have no personal experience in this so I can’t say if this type of investment is good or bad. But my gut would say that it is just like currency above – you have to put in the research and work to make a profit. In the last 10 years, peer-to-peer lending has taken off in popularity. With this type of investing, you are the lender, loaning money to other people. The borrowers post how much they need and after the website does a financial check on them, assigns a rough interest rate. You, along with others, then fund their loan. Once fully funded, the borrower begins to pay back the loan to you and the other lenders on a monthly basis. I used to invest in peer-to-peer lending. It was fun to help out others and at the same time earn a nice return. When investing this way you do run the risk of losing your principal, but with the loans I invested in, I never encountered this problem. Lending Club is a great peer to peer lending company that offers great loans with low interest. Below is a chart I created breaking out the various types of investments I mention along with the risk associated with them. Remember that the higher the risk, the greater the return potential. For most readers, you are best served by keeping your emergency money and any other money needed in less than 5 years in a savings account and short-term bonds. I know you won’t earn much with the low interest rates we have right now but your money will be safe. From there, I would go the traditional route and invest my long-term money in a combination of stocks and bonds. You can get my book, 7 Investing Steps That Will Make You Wealthy, for a guide on how to invest the right way. You can also go the automatic route and invest with a firm like Betterment. Either option will see you reach your goals. If you do want to diversify further, rental real estate is my choice. But, you can choose any number of alternative investment types. I would just caution that you stay diversified and invest in a various combination of investments. In the end, there are many types of investments for you to choose from. Your first step should be to decide on when you need the money. This will help you to decide on what path to take – short-term or long-term. From there, you can begin to work on which investment(s) make the most sense for you. If you have any questions with this part of the process, don’t hesitate to contact me. Hi Jon – I am wondering what your thoughts are on breaking down the various buckets into further sub-buckets. For example, in the stocks bucket there could be large-cap, small-cap, emerging markets, etc. I believe that people often get confused once they break things down further which ends up in “paralysis by analysis”? Any tips on how to think about that?